For nearly a century, Rust-Oleum's paints and coatings have been protecting industrial and commercial surfaces from rust, corrosion, and harsh environmental conditions. Because of its high quality, it's become a preferred protective floor coating for warehouse and manufacturing sites, as well as hospitals, schools, and other institutional facilities. Today, Rust-Oleum's line of coatings are also used to protect interior floors, home garage and other surfaces in residential properties. 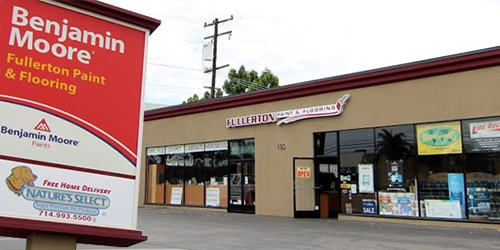 As an authorized independent Rust-Oleum dealer in Orange County with over 20 years of experience, Fullerton Paint & Flooring is qualified to provide reliable floor coating consultations. We'll listen to your goals and determine which Rust-Oleum products would best serve your needs. At Fullerton Paint & Flooring, we recommend Rust-Oleum 100% solids epoxy for its performance in heavy duty, high-traffic areas. The unique Rust-Oleum floor coating formula allows it to withstand chemical spills, foot and rubber-tire traffic, and wear and tear from power washing. It's also easy to maintain. Its low viscosity blend allows for easier application and smoother finishes. When applied, customers can count on low odor and low VOC release. Additionally, decorative chips can be added to create unique designs ranging from a speckled effect to a terrazzo-style look. Come visit us at Fullerton Paint & Flooring to learn more about Rust-Oleum products.